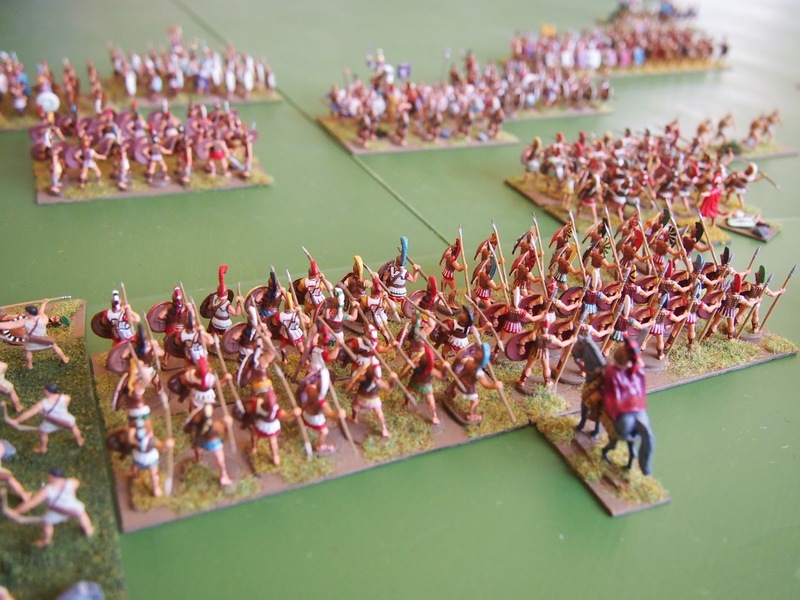 The Battle of Akragas was fought in 406 BC during the Second Sicilian War (or Second Greco-Punic War) for control of Sicily. 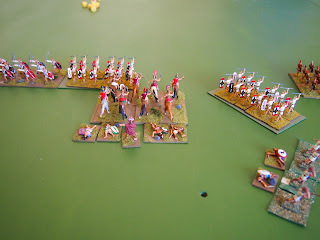 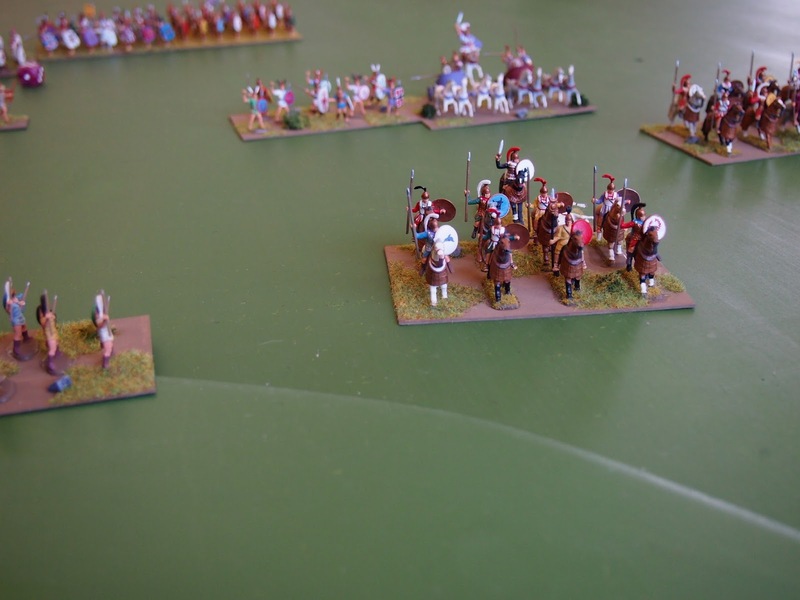 We played our game of the battle on 12th November 2016, using Impetus rules. 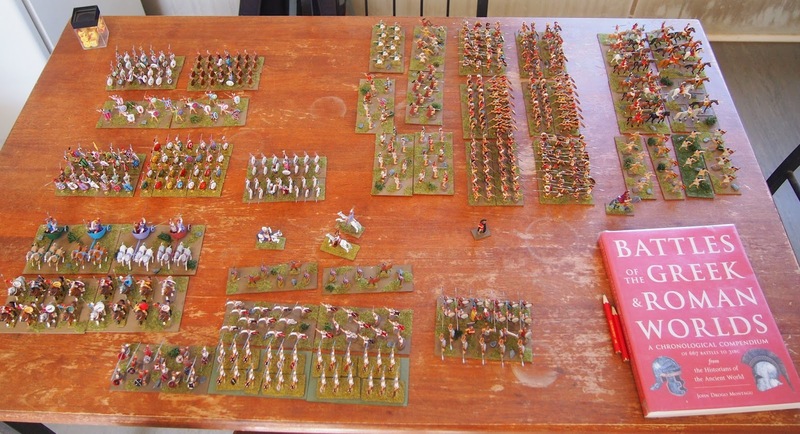 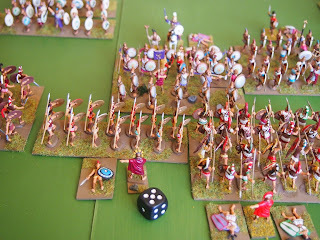 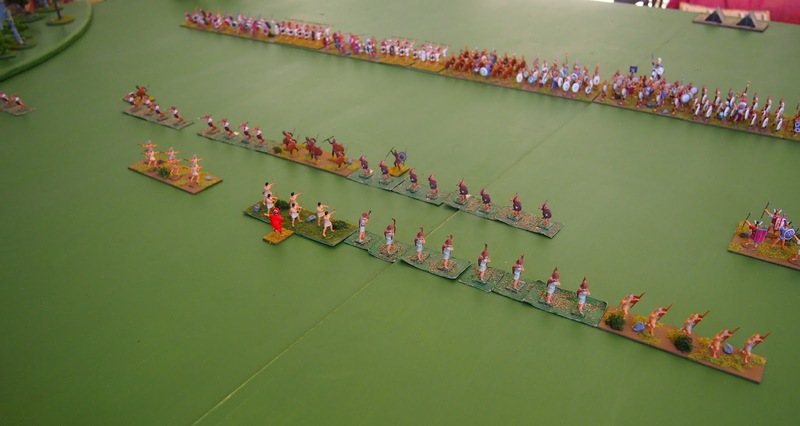 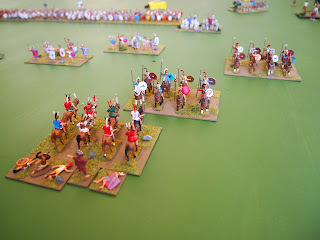 That fabulous inspiration for wargames "Battles of the Greek and Roman Worlds" provided just that (and some information) which Mark used for this game. 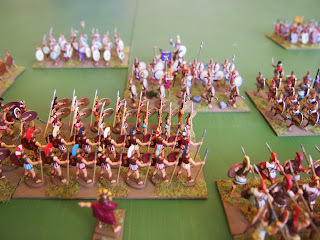 The Carthaginians, led by Himilco (whose military bearing, according to legend, derived from his birth in a cross-fire), had laid siege to Akragas in Sicily. A relieving army, led by Daphnaeus of Syracuse, came to break the siege. Himilco led part of his army, seen here at right of the photo, to intercept the Greeks (leaving the remainder to continue the siege). 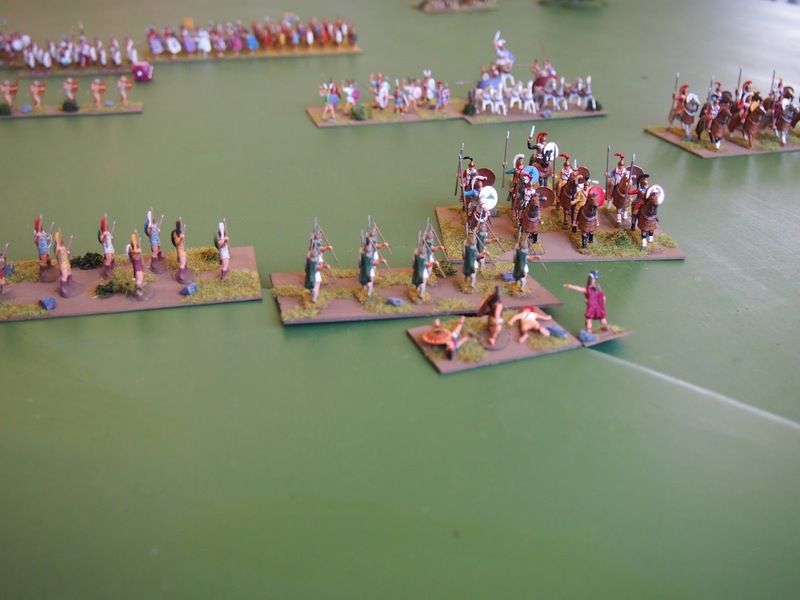 Battle was joined in the valley of the River Himera. 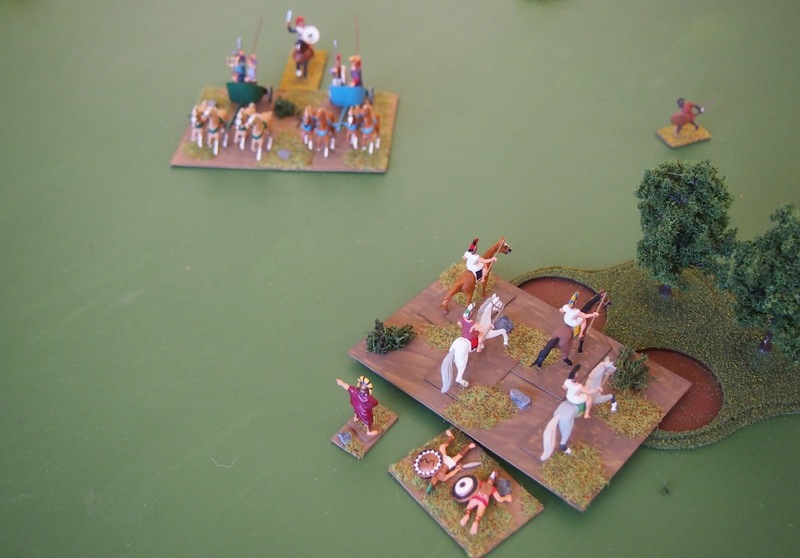 It is reported that the Himilco sacrificed a child and some animals. 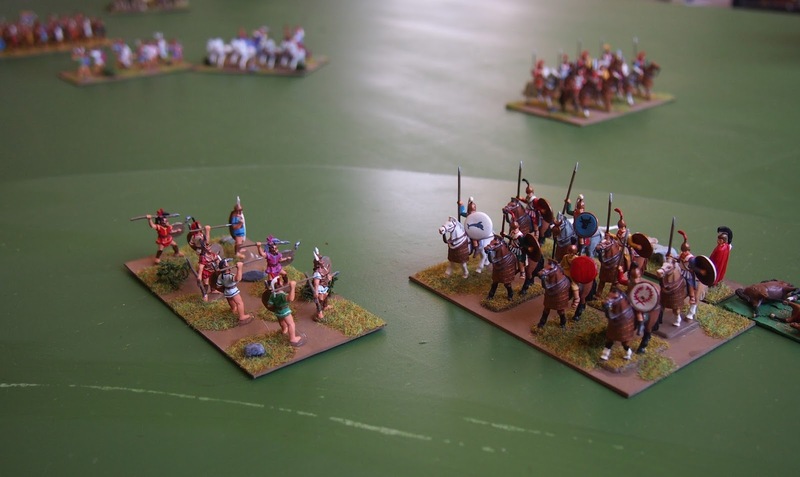 The Greeks settled on a lamb. 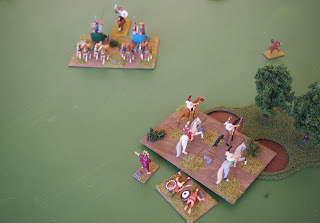 Perhaps a more powerful sacrifice was needed. 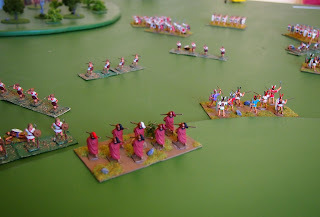 A poor start for Daphnaeus (double one means a drop in one level of command rating for the rest of the game). The cavalry and light troops of both sides advanced. 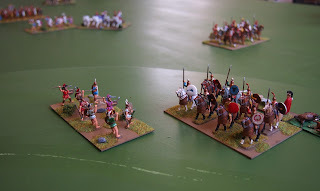 Daphnaeus sent his light cavalry to disrupt the Carthaginian heavy chariots, but those buggers throw javelins too! 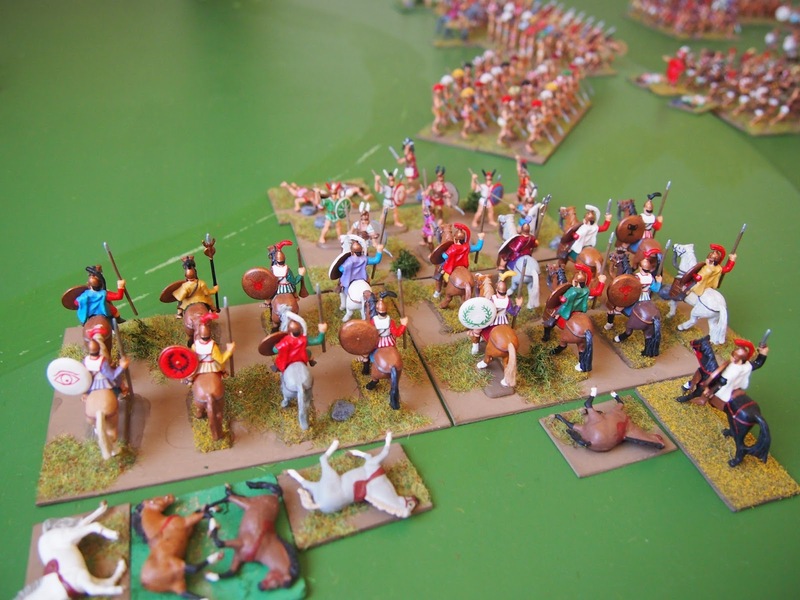 The Greek cavalry sought the cover of the woods. 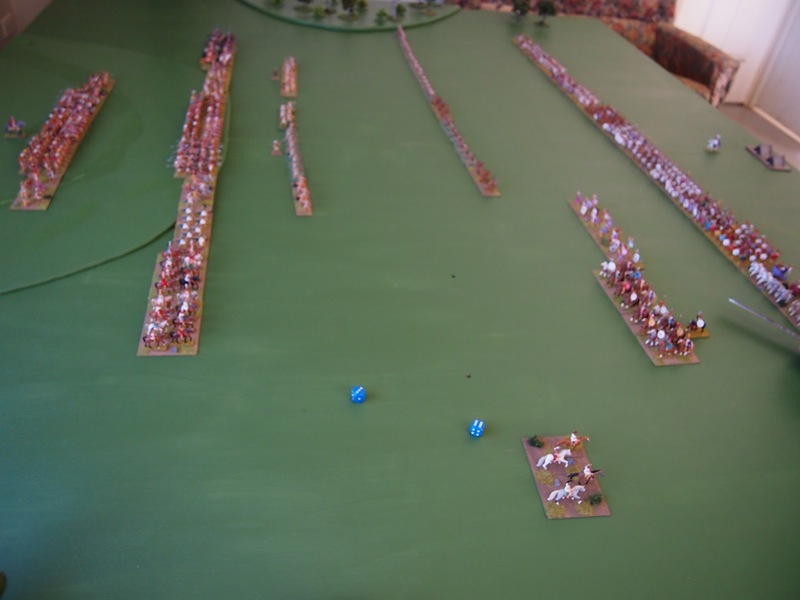 The skirmish lines exchanged pleasantries. 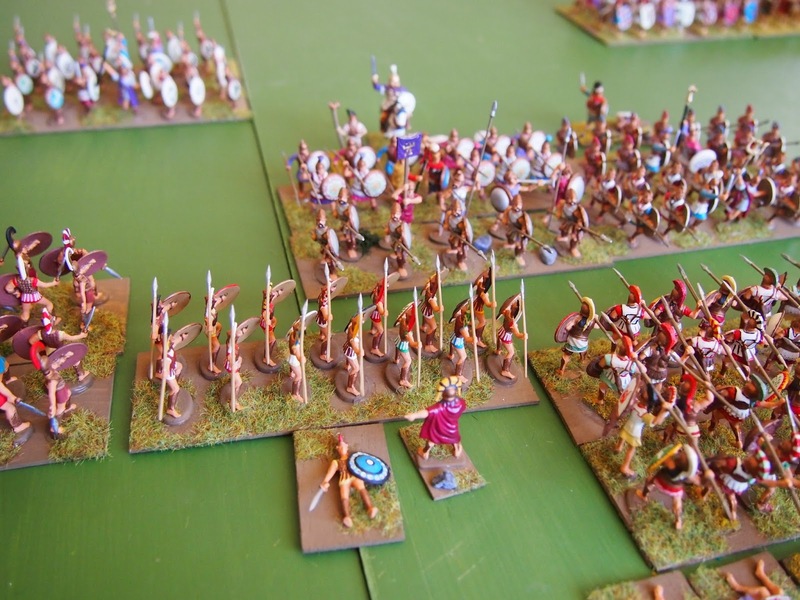 Himilco advanced his spearmen, while the Greek hoplites remained on the hill. 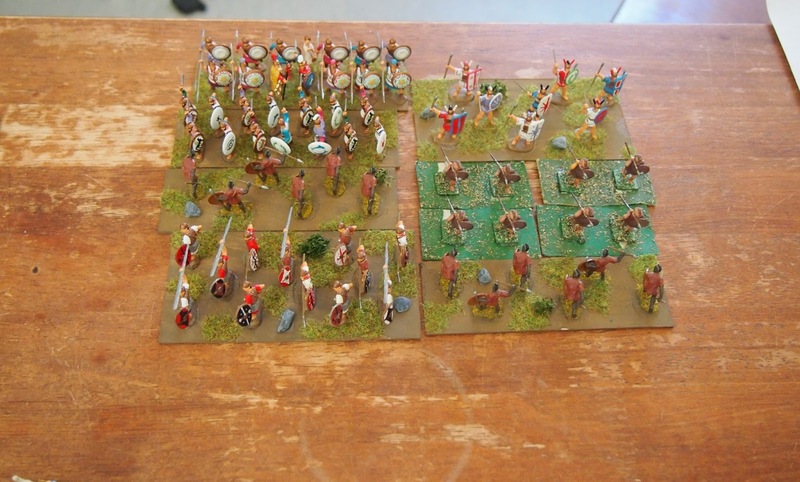 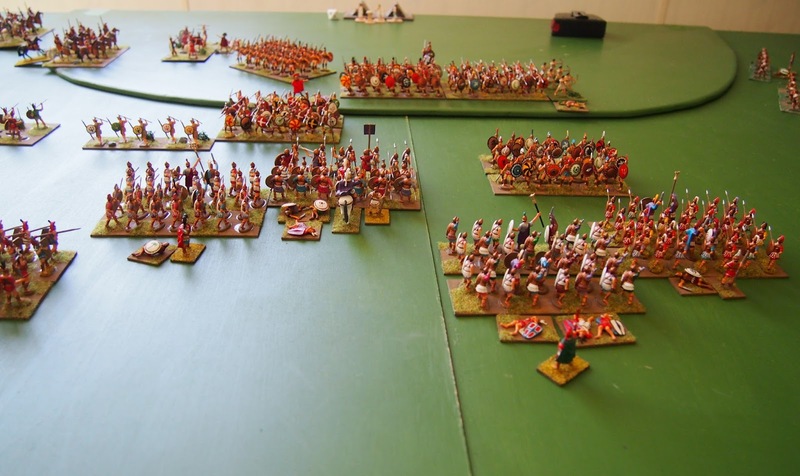 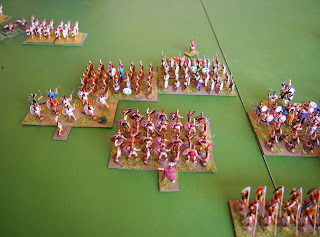 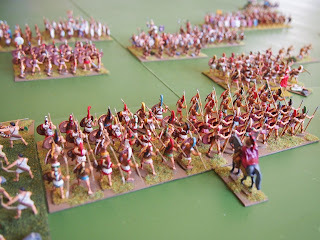 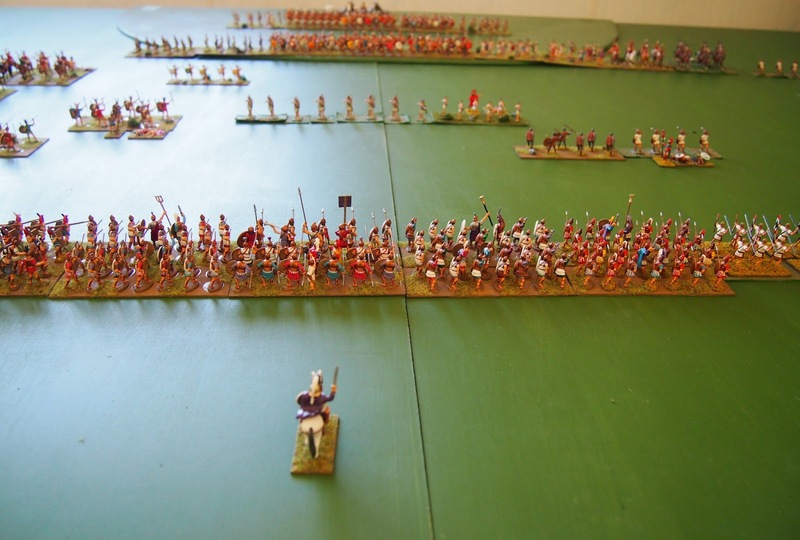 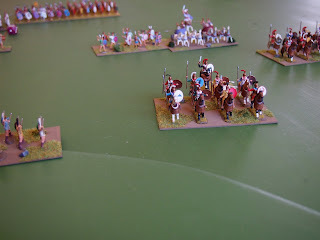 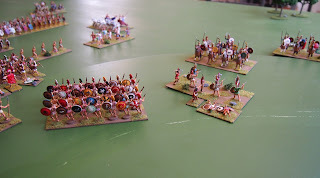 ... leaving the Carthaginians free to make merry with the Greek light infantry. 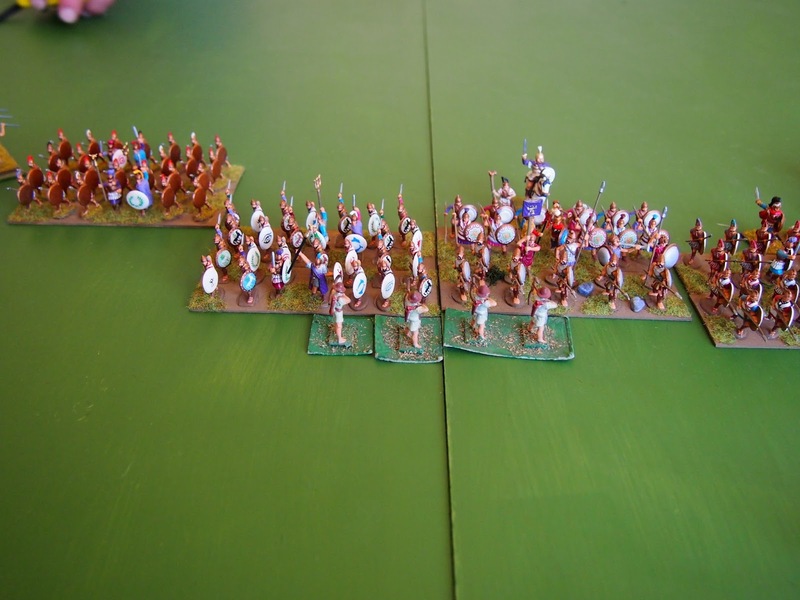 The Greek skirmishers attempted to disrupt the Carthaginian spearmen. 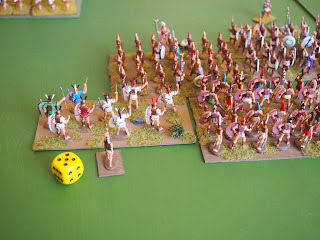 Now the Libyan's were getting in on the act. 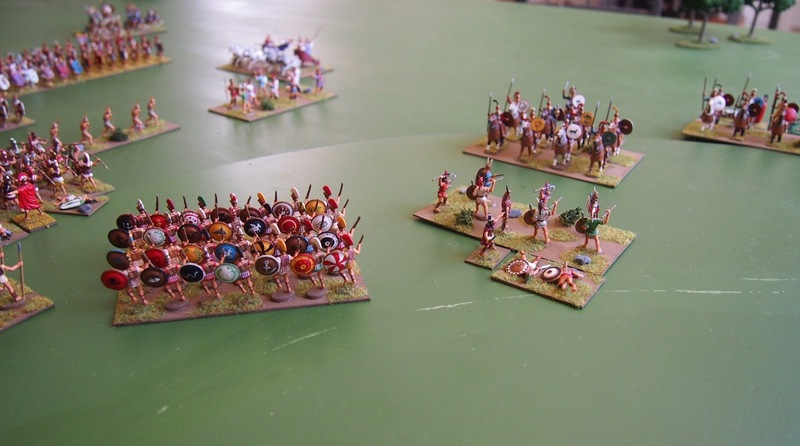 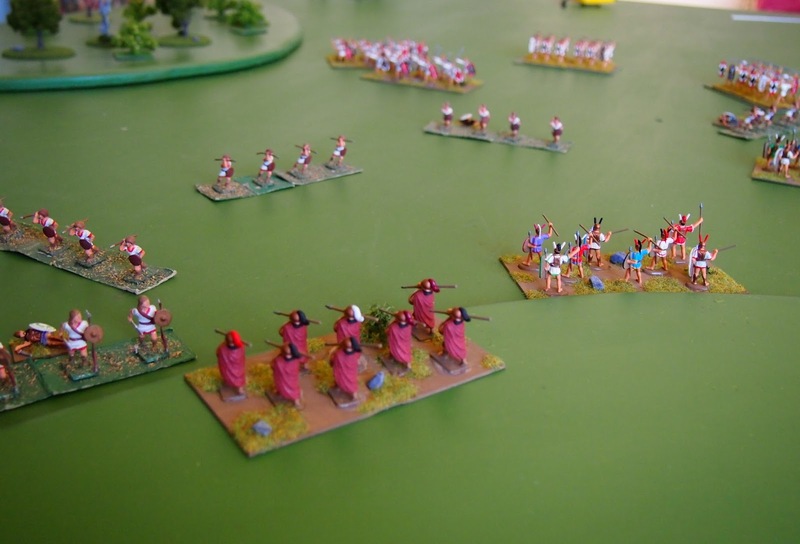 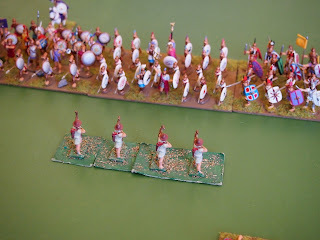 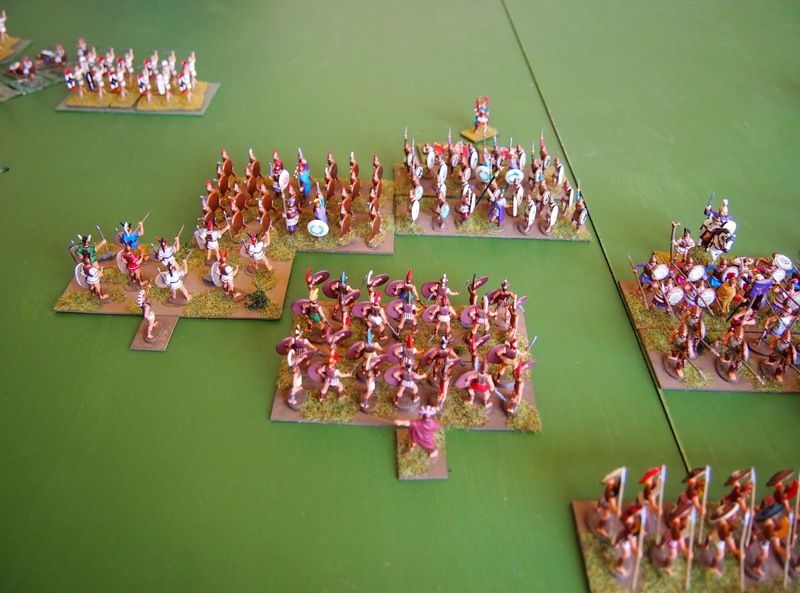 The Greek skirmishers' javelins merely bounced off the armour of the enemy's spearmen. 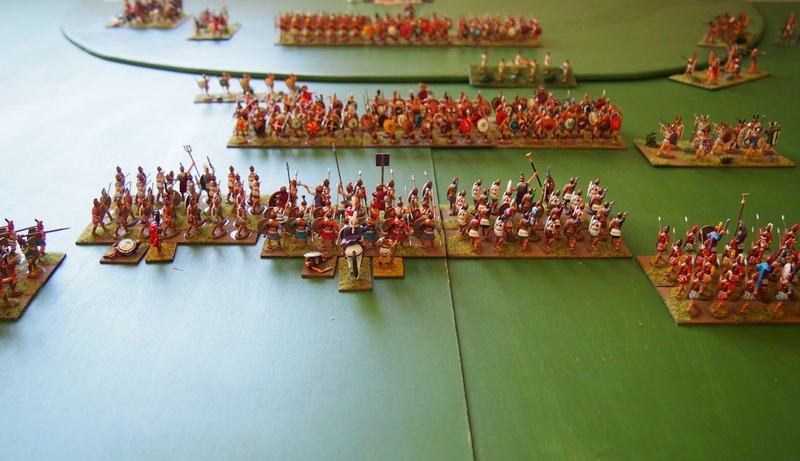 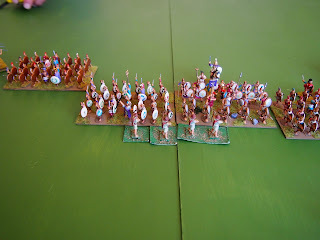 Carthaginian skirmishers running amok on the left. 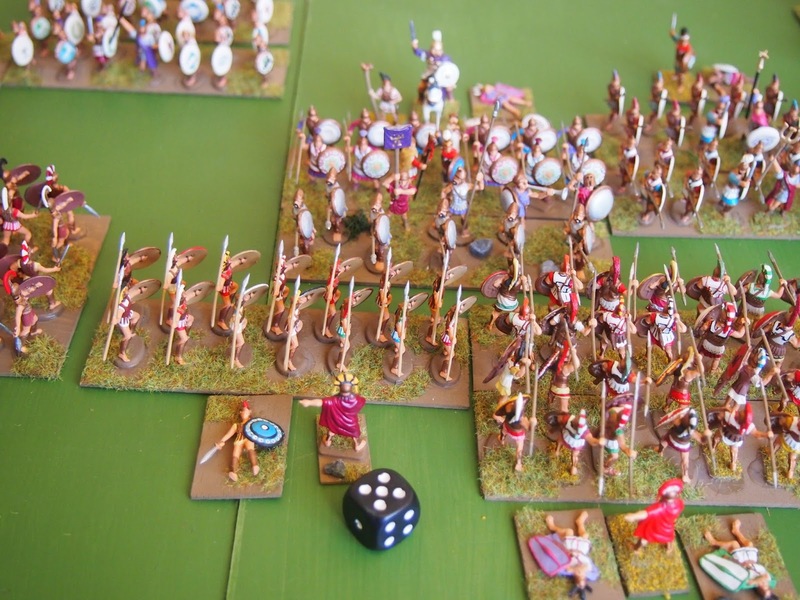 It was down to the hoplites on the hill. The main game. 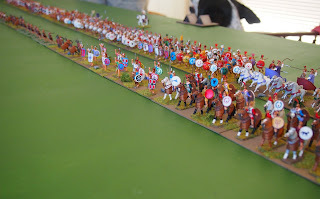 Hold your nerve boys! 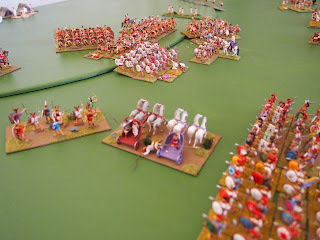 The charge fell short; disorder the result. 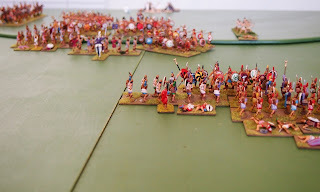 The Carthaginians took full advantage. 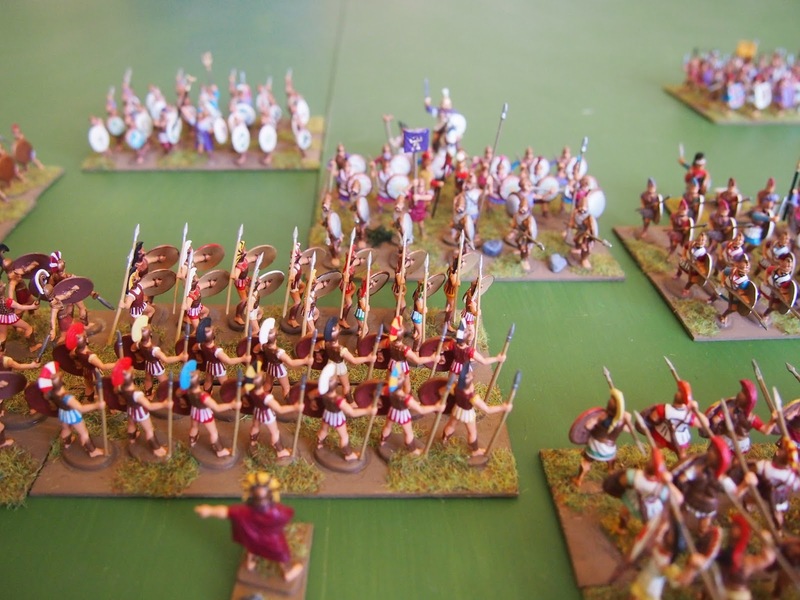 Daphnaeus held the last of the hoplites in reserve. 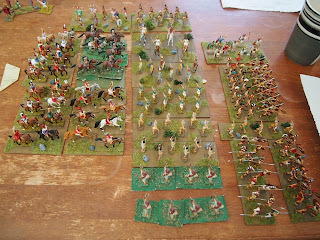 But his flanks were crumbling. 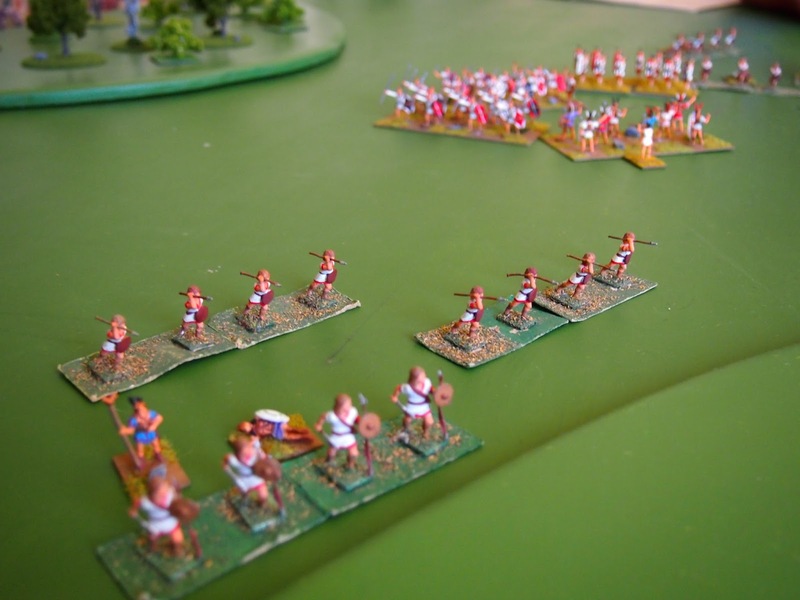 Across the battlefield, Hilmico went in for the kill. There will be few Greek survivors from this one. 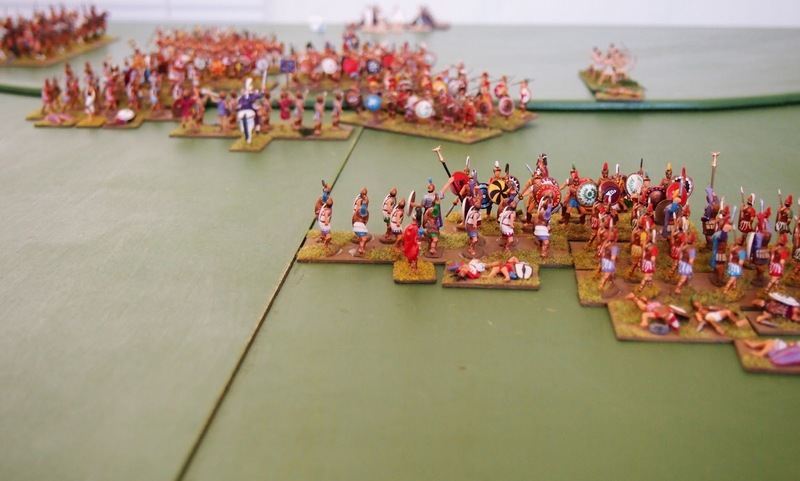 The casualty tables tell the tale: Greek above and Carthage below. Rarely are victories this complete. 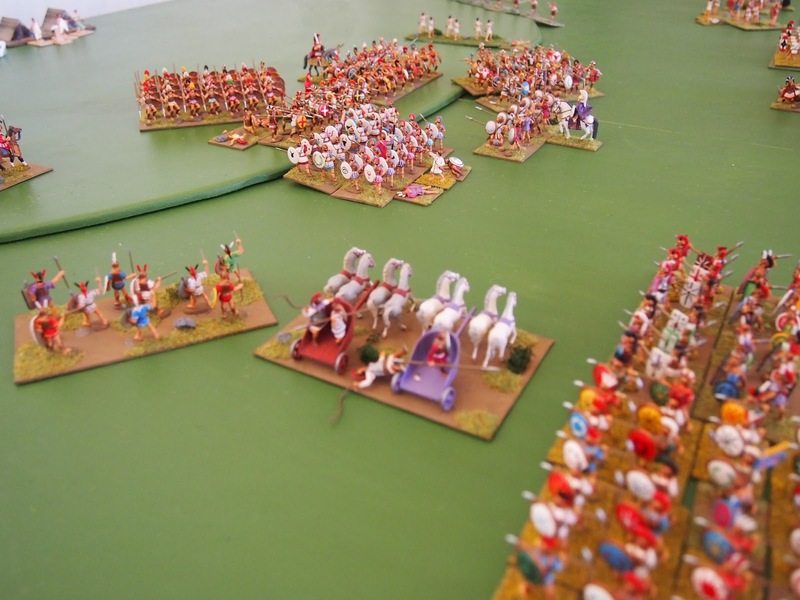 The musicians of Carthage wrote an ode to the great victory. Well, it's all right now, in fact it's a gas. 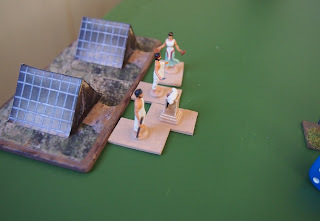 Akragas-gas is a gas, gas, gas! Speakers up nice and loud! 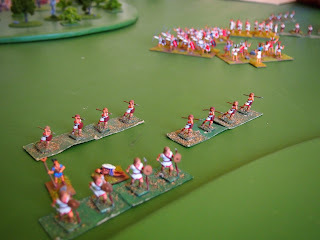 I trust that you sang along with those Carthaginian minstrels Phil?! It's great to see games of battles outside the norm. Thanks. 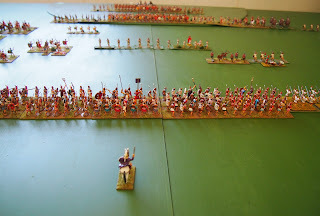 There are a few more in the 18 battle reports that we have to catch up on! 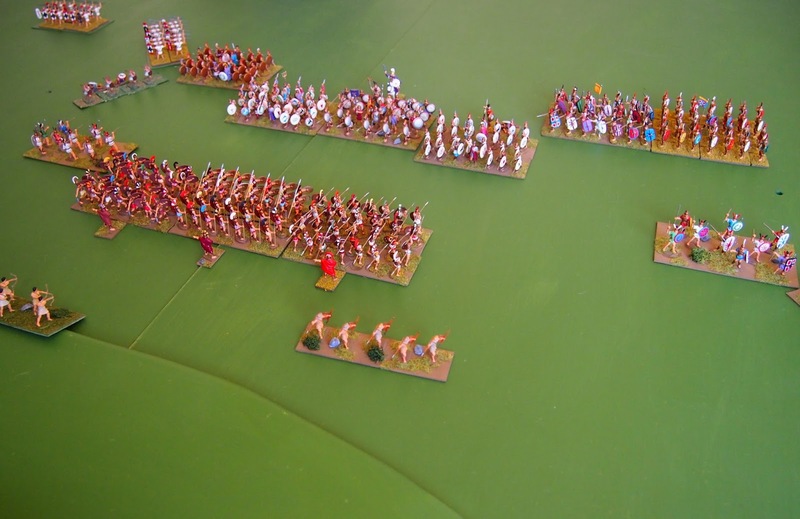 Very colorful armies, James. 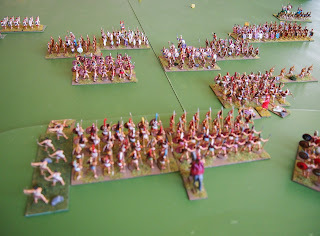 Rolling Stones and ancient warfare; a good combination. 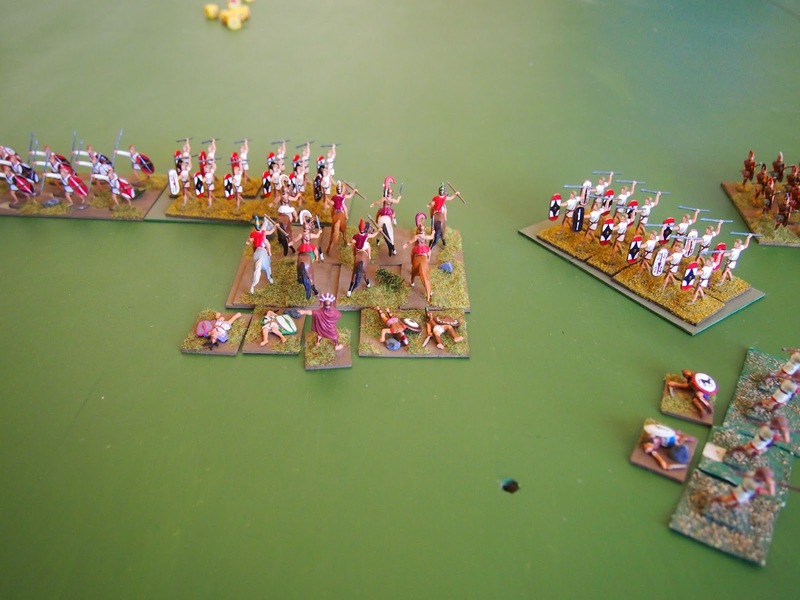 Thanks Jonathan. 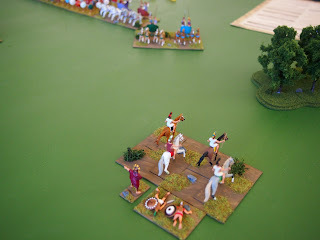 Mark came up with the witty pun. 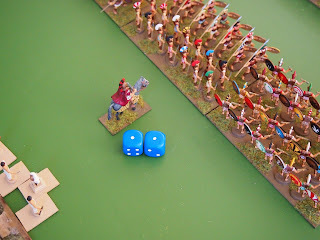 Given the result, he was the only one thinking that it was a gas!! It would seem that Himilco booted the sissies out of Sicily! 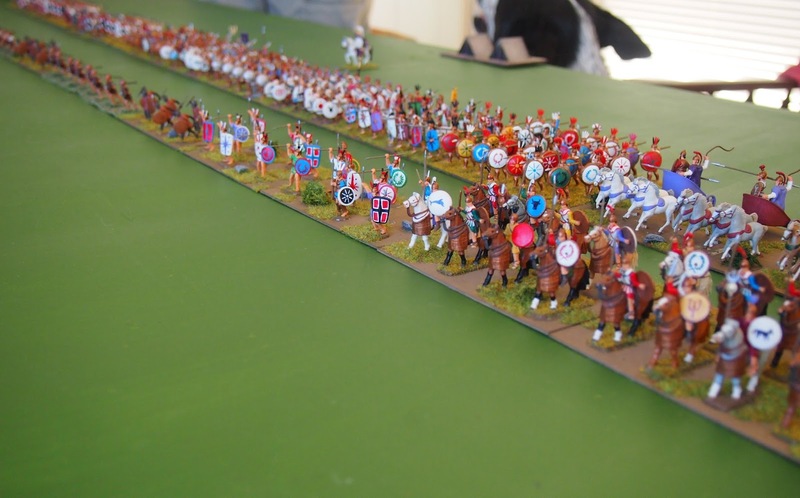 Good to see you getting amongst the puns Peter!